Weight loss is a challenge for most of us. To lose some kilos, most of us would try everything we read and hear of. 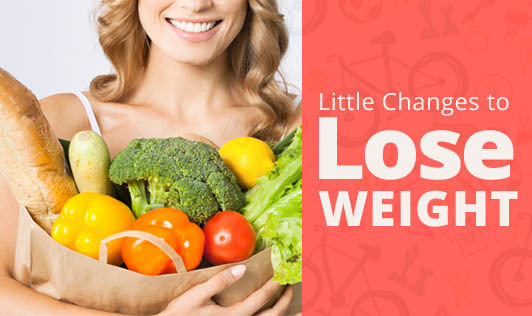 To effectively lose weight, one needs to make a few changes in their daily routine. These changes may take time for you to follow, but it is not impossible to follow the ones listed below. Dedication and motivation are like salt and pepper to a weight loss program. 1. Eat more fresh fruit and veggies and skip the fruit juices. 2. Choose 100% whole grains and avoid maida and its processed foods. 3. Drink at least 8 to 10 glasses of water. 4. Include a portion of protein in your breakfast like eggs, peas, and a cup of curds or milk. 5. Choose to have healthy snacks with alcohol. Limit your alcohol intake. 6. Don't eat in front of the TV. You'll be more likely to eat more. 7. Cook with heart healthy olive oil not butter or other fats. 8. Start your meal with a soup or a salad. 9. Choose dark chocolate instead of milk chocolates. 10. Avoid fast food and processed foods. 11. Choose skimmed, soy or almond milk over full fat milk and cream. 12. Move more, take the stairs, do squats or yoga while you're watching TV, stand at your desk while working. 13. Plan active outdoor activities. 14. Skip the sugar in your coffee or cereal. 15. Snack smart, choose fruits, low fat yogurt, nuts, or veggies and hummus to stay satisfied. 16. Chew minty gum to ward off cravings. 17. If you go out to dinner, choose an alcohol or dessert, but not both. 18. Get at least 7 hours of sleep. Being tired makes you more likely to eat more. 19. Flavor your food with spices and herbs instead of salt and sugar. 21. Take a walk about an hour after dinner. 22. Add strength training to your exercise regimen. More muscle, more calories burned all day long. 23. Use a pedometer; try to walk more steps every day. 24. Park your car far away so you'll walk more steps and burn more calories or walk instead of drive. 25. Put your workouts on your calendar. You'll be more likely to do them.